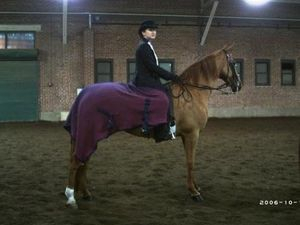 2012 American Saddlebred Horse Association High Point results are in. The classes are based on the horse except for equitation is based on the rider. Participants are required to show in each division area 3 or more times at 3 different shows. The results listed below are based on the 2012 High Point rules. Congratulations to the following Irish Hills Farm riders and horses in 2012 American Saddlebred Horse Association High Point! Congratulation to IHF riders at the 2012 IL Jr. Horse Show! 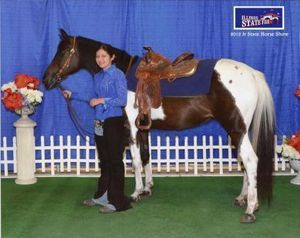 Elena and DRK Sassy Doll reveived the 2012 Reserve Champion Overall Saddle Seat Champion at the IL State Jr. Horse Show in July. They competed in Saddle Seat Pleasure, Road Hack, Society Western Pleasure, Saddle Seat Halter, Saddle Seat Showmanship, Saddle Seat Equitation,and Dressage. 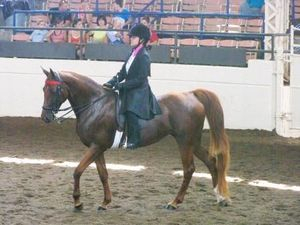 They also competed in Traditional Hunt Seat Pleasure, Hunt Seat Equitation, and Barrels. Elena and DRK Sassy Doll also qualified and competed in versatility on Saturday night. Also a big Congratulations to Thalia J and Charlie at the Dog Show. They received Grand Champion Junior Showmanship. Congratulations! American Saddlebred Horse Association added a High Point System for registered and half registered saddlebreds where USEF and non USEF shows will counts as points for each saddlebred and/or equitation rider. The show resuts wil be under the horse's name in the ASHA database. Local shows are included in the high point. It is a great opportunity for all members to show their registered and half registered saddlebreds. Thank you to Galesburg Boots and Saddle Club, Rusty Spur 4-H open youth show, and Lamoine Trails Saddle Club Futurity show. Thank you American Saddlebred Horse Association! High Point's Ivory Coast's first 3 foals arrive this spring. They are all 3 golden in color. 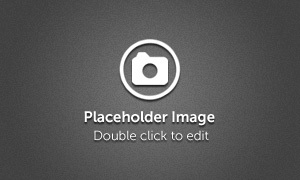 There are pictures in the photo gallery under 2012 foals. A palomino colt out of Sultan's Fancy Jane on April 7, 2012, at 10:30 am. He has 4 white socks and blaze. His name is Chillin With Buggs Bunny. He is owned by Thalia. Look for him in Futurity show ring. A palomino filly out of Stonewall's April Ice on April 11, 2012, in the early morning. April was checked at 2 am and there was no foal. At 5 am she was checked again. This filly was cleaned off, dry, and up running around. She has 3 white socks, star, stripe, and snipe. Her name is Ivory's Crystal Slipper. Look for her in the Futurity show ring. She is for sale. A golden filly out of Lady Beau Chrome arrived on May 24, 2012. She has star and stripe. She is owned by Joleen. Look for more golden foals in 2013. Elena and DRK Sassy Doll competed in the 2012 IL Horse Fair Queen Contest. They competed March 2-4 in Springfield, IL. Elena and Sassy placed 2nd in horsemanship division. Congratulations on a great ride! Thank you to Americna Saddlebred Horse Association and Irish Hills Farm for sponsoring Elena and DRK Sassy Doll. See their performance on the video page. See pictures of the 2012 Queen contest on the photo gallery page.